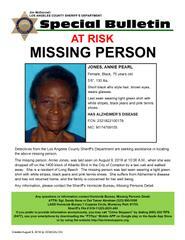 Los Angeles County Sheriff’s Department’s Missing Persons Unit detectives are asking for the public’s help in locating Annie Pearl Jones. 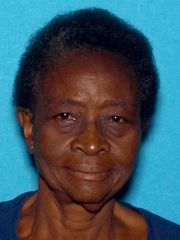 She is a 75 year-old female Black who was last seen when she was dropped off on the 1400 block of Atlantic Boulevard in the City of Compton by a taxi cab, and walked away, Thursday, August 9, 2018, at approximately 10:00 a.m.
Ms. Jones is described as 5’06” tall, 130 lbs., short black hair, brown eyes, and wears glasses. She was last seen wearing a light green shirt with white stripes, black jeans and pink tennis shoes. She suffers from Alzheimer’s disease and has not returned home. Her family is very concerned and asking for the public’s help in located her.